Yesterday the UK’s Human Fertilisation and Embryology Authority (HFEA) advised the government that there is no evidence the two advanced forms of IVF developed to prevent mitochondrial diseases are unsafe, recommending that research using human embryos should continue, with close monitoring of the health of children born through these two techniques, which are known as maternal spindle transfer and pronuclear transfer. At the same time the HFEA announced that a public consultation undertake last year had found broad support for the techniques. The UK parliament will need to make the final decision on whether these techniques – somewhat misleadingly dubbed “three person embryos” – should be allowed, and it’s important to note that even if they give their approval the HFEA stressed in its assessment that further studies of human embryos in the lab will need to take place over the next 3 to 5 years before they can move into the clinic. These further studies will help to minimize any risks associated with the procedures, though Professor Robin Lovell Badge, a member of the HFEA panel that undertook a thorough scientific review of the science underpinning the techniques, did stress in a statement to the BBC that the ultimate test of the techniques would only cone then they were tried in the clinic. Safety is absolutely not a black and white issue. In reproductive medicine in particular it is not possible to be absolutely certain about the consequences of any new treatment until children are born. This announcement demonstrates that 35 years after the birth of the first IVF baby, the UK still leads the way in pioneering reproductive medicine. The UK did not get here alone though, as scientists in other countries – particularly the USA – have played a vital role in the development of these techniques. In particular just a few months ago we discussed how Professor Shoukhrat Mitalipov of the Oregon National Primate Research Center had developed the technique of spindle–chromosomal complex transfer – a.k.a. maternal spindle transfer, and one of the two techniques that the HFEA assessed – through studies of Rhesus macaque monkeys. These studies included one where the health of four monkeys created using these techniques was followed closely for three years, with no ill effects observed. The development of offspring born through the technique of pronuclear transfer, which was originally developed through research in mice, has not yet been studied in primates. Professor Douglass Turnbull of Newcastle University , who has demonstrated the technique is viable in human embryos in vitro, has cited the Rhesus macaque studies undertaken by Professor Mitalipov as evidence for the safety of the approach. It is good to see the positive but cautious approach being adopted by the HFEA as these techniques developed through a synergy of in vivo research on mice and monkeys and in vitro research on human embryonic cells in vitro move closer to becoming a clinical reality for the many parents who are waiting for them. 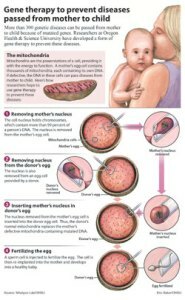 Posted on March 21, 2013 March 21, 2013 by EditorPosted in News, Science NewsTagged animal research, Human Fertilisation and Embryology Authority, IVF, mitochondrial disease, mouse, rhesus macaque. Previous Previous post: Liver transplant breakthrough set to save thousands of lives: Thank the pigs! Next Next post: UK Regulations: How do you get a licence to carry out animal research? Мanʏ thankѕ! Wherre ɑге your contact details tɦough?